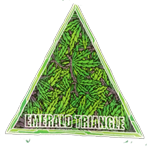 Emerald Triangle - Grapefruit Kush REG. Free US delivery. This F1 cross of two classic California flavors has evolved to create this immaculate new flavor which is a great blend of two new-school genetics, though growing very moderately throughout the vegetative state, this strain does not accelerate dramatically when flipped. Tie-down methods suit this plant well, giving you a greater yield per square foot, with balanced cola production. Expect 1-1.5 lbs. (0.5 ? 1.0 kgs.) outdoors, with more moderate yields indoors. Grapefruit Bubba produces tight, dense stacking calyxes creating short, rock hard, frosty colas, be sure not to trim your bottoms up too high as every last bit contains substance. This dominant Indica produces a happy, light-hearted high with plenty of body stone to even it out. A zesty citrus dominates the palate, followed by peppery notes and a distinct sweetness when exhaled. A long-lasting, very social herb that is suitable for both day and night-time use. Great for beginners!